The opening “Hebrides (Fingal’s Cave) Overture” began with a haunting musical phrase that echoed the sound of waves against the shore which Mendelssohn heard when he visited the Hebrides islands off Scotland in 1829. Subsequent calm and stormy passages reflected the vagaries of Scottish weather before the Overture returns to the opening theme for a quiet ending. The SSO and Rhodes gave this colorful score an energetic performance. Inspired 50 years later by the novels of Sir Walter Scott, Bruch quoted various Scottish folk songs in his “Scottish Fantasy” for violin and orchestra. Its four movements depicted contrasting moods, from a solemn introductory Adagio to a lively Scherzo, a radiant Andante, and a joyous Finale. 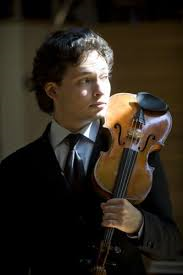 Rising young Boston-based Russian-American violinist Yevgeny Kutik, who dazzled in his SSO debut three years ago with Prokofiev’s second violin concerto, brought technical virtuosity to spare and interpretive flair to this brilliant showpiece. Orchestra and conductor gave him exemplary support, especially principal harpist Judy Saiki. Unlike Bruch, Mendelssohn quoted no folk tunes in either the “Hebrides Overture” or the work which closed the program after intermission, his third symphony, nicknamed the “Scottish” because it derived from the same 1829 visit to Scotland, though it took the composer until 1842 to finish it. Rhodes led the SSO in a blazing account, heightening the drama of the turbulent first movement by taking a repeat that’s often omitted. The dance-like Vivace movement had an exhilarating spin, the glowing Adagio was deeply felt, and the triumphant Allegro finale blended vigor with grandeur. Even without the benefit of spoken commentary by the often talkative maestro, the appreciative crowd who braved the wintry chill was rewarded with the warmth of his enthusiastic leadership.